Riccardo Meacci (1856-1938) was born in Dolciano, a province of Sienna. He studied at the Instituto di Belle Arti di Sienna, where he was trained by Luigi Mussini. He worked in Biringucci until 1881, when he moved to Florence. He was greatly influenced by antiquity and especially the fourteenth century, all his works have religious and allegorical context and are painted with absolute intricacy and attention to detail. His work was appreciated more by foreign countries rather than his native Italy, and he was especially recognised by the English aristocracy, many of whom were his patrons. He received commissions from Queen Victoria, the Earl of Lothian, the Duke of Connaught, Prince Franz of Lichtenstein and Leopold of Hohenzollern. However at the 80th National Exhibition three paintings were commissioned by the Palazzo Pitti in Florence; The Arrival of the Convicts, The Offering of the Country, and The Three Wise Men. Many of Meacci's works can still be seen today in Sienna. 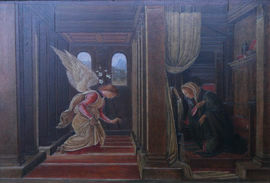 One of them is a triptych in the Basilica of Saint Francis, St Peter Receiving the Keys. He also executed a frescoe in the Monumental Room of the town hall in Sienna, depicting various Italian provinces.